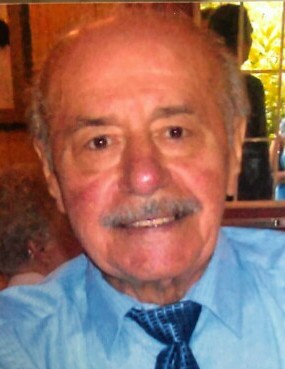 Michael L. Corsaro, 87, of South Greensburg, died Tuesday, Sept. 4, 2018, at home. He was born Feb. 25, 1931, in Greensburg, a son of the late Louis and Mary Zappone Corsaro. Mike was a truck driver for Charley Brother's Super Valu and a veteran of the Korean Conflict, having served in the Army. He was a member of St. Bruno Church, VFW Post 33, American Legion Post 981, the Hilltop Social Club and the AMS Club. In addition to his parents, he was preceded in death by his wife, Margaret A. Plummer Corsaro; a son, Michael Corsaro; and a sister, Carmella Sasso. He is survived by his five children, Michelle Steiner (Steve), of Youngwood, Victoria Haines (Dennis), Mary Jo Taylor, Daniel Corsaro and David Corsaro (Lisa), all of Greensburg; 13 grandchildren; eight great-grandchildren; three great-great-grandchildren; a brother, John Corsaro (Jacqueline), of Greensburg; and several nieces and nephews. Relatives and friends are invited to celebrate the life of Mike from 4 to 8 p.m. Thursday in the CLEMENT L. PANTALONE FUNERAL HOME INC., 409 W. Pittsburgh St., Greensburg, PA 15601, 724-837-0020. Parting prayers will be held at 9:15 a.m. Friday in the funeral home, followed by a funeral Mass to be celebrated at 10 a.m. in St. Bruno Church, South Greensburg. Entombment will follow in Greensburg Catholic Cemetery Mausoleum. Mike's family has entrusted his care to the Pantalone Funeral Home Inc., Greensburg. To share your memories and photos, offer your condolences or for directions, please visit us at www.pantalone.com. Natale N. Pantalone, supervisor.